Suspense at its finest! Sandra is skilled at creating a plot! Twists and Turns abound in this book about Dawson Scott, a magazine journalist, just back from covering the war in Afghanistan and Amelia Nolan, ex-wife of Jeremy Wesson, a former Marine presumed dead. Sandra takes us from a 1976 shoot out to a 2013 murder trial. What's the link between the two? The interest of FBI Agent Gary Headly. Amelia, along with her two cute little boys, help Dawson to heal from PTSD, although it takes a long time and with a stubborn Amelia to keep Dawson from pushing her away. There is just enough romance to make me happy but the thrills, OH MY, kept me hanging in there! Shocking plot twist at the end that will leave you stunned! I wasn't expecting it! Yummy romance, murder, sociopaths, and drama combined to make a fantastic read! 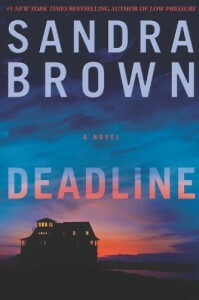 I recomemend any thriller buff to give Sandra a chance! She's one of the leaders of writing romantic suspense, although this one was more of a thriller!